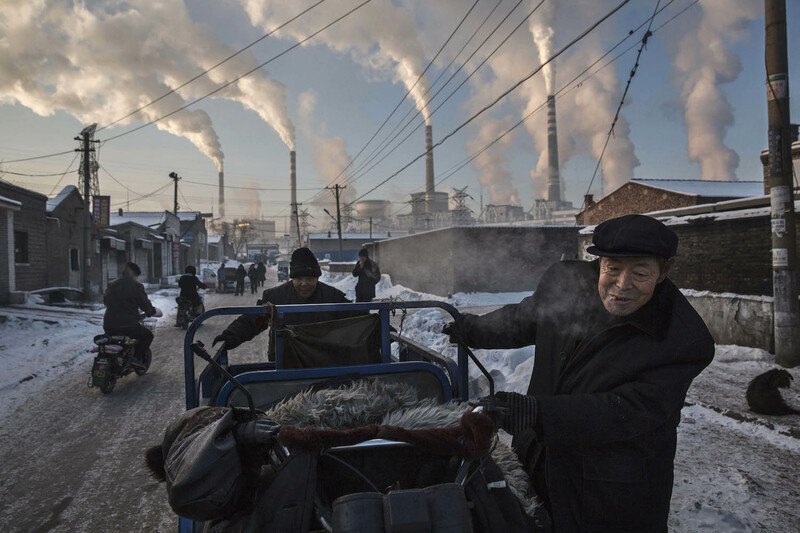 Smoke billows from stacks as Chinese men pull a tricycle in a neighborhood next to a coal-fired power plant on November 26, 2015 in Shanxi, China. With the U.S. leadership role in the fight against climate change now being called into question, China has found itself in the unique position of being a global leader of the cause. In this podcast, nonresident Carnegie-Tsinghua scholar Wang Tao spoke with Yang Fuqiang, a senior advisor on climate and energy at the National Resource Defense Council, about China’s ongoing energy transition. While China’s coal consumption has declined since 2014, Yang described the many challenges China faces in meeting its coal reduction targets in the coming years. The Chinese central government has launched multiple policies and regulations targeted at reducing coal usage, but it has faced stiff resistance in getting local governments to implement these regulations. Yang asserted that if China hopes to meet its goal of creating the largest carbon-trading market in the world beginning in 2017, the nation will need to address the dearth of accurate data on carbon emissions and develop strong regulatory bodies. To achieve these and many other goals, Yang emphasized the importance of comprehensive top-down and bottom-up policies aimed at tackling climate change. These challenges aside, Yang pointed out that ratification of the Paris Climate agreement, a push for a national cap-and-trade program for carbon emissions, and declining coal usage all point toward China’s strengthening commitment to be a leading force in combating the effects of climate change for the foreseeable future.